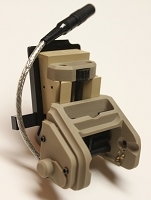 EVO / Gallet - Gentex NVG IT Multi Helmet Mount Adapter. (Be aware that our Adapter has been copied by Tiger Performance and his version will not work properly. MSA Gallet Helmet NVG / Gentex Helmet NVG IT adapter by HHC. 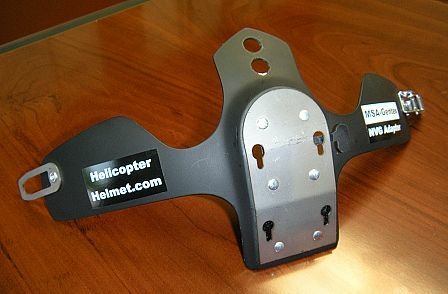 The HHC MSA Gallet Helmet NVG / Gentex Helmet NVG IT Multi Helmet Mount Adapter is designed and manufactured by Helicopter Helmet.com, The Multi helmet NVG adapter allows users of MSA Gallet helmets to share the NVG Mounts using the quick disconnect system found on Gentex and Non Gentex Style Helicopter Helmets. Made of carbon fiber and stainless steel, this little adapter will save you money and comes ready to snap on. 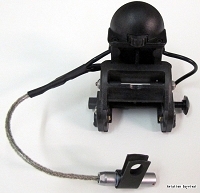 Attaches the same way as the OEM Adapter on all MSA NVG ready helmets.